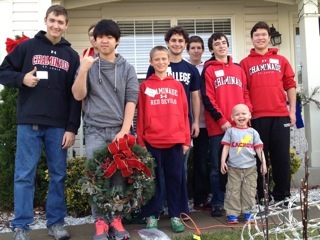 Chaminade College Preparatory had their annual Mother/Son Service Day on December 1st. We were very excited when they expressed interest in helping the families with Friends of Kids with Cancer again this year! This year's service project was especially welcomed because they were able to help some of our families for the holidays by hanging their Christmas lights and decorations. They even topped it off by bringing fresh baked cookies! The students and faculty at Chaminade have continued to support Friends of Kids with Cancer in many ways.